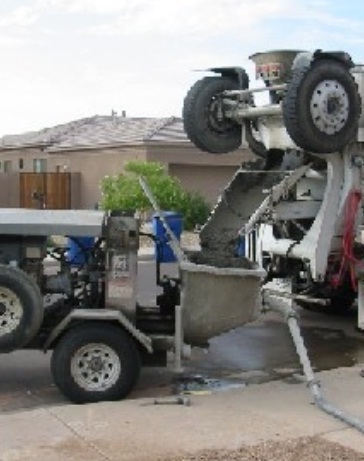 Chute is used in concrete transporting to reach concrete from a level where mixing is done. 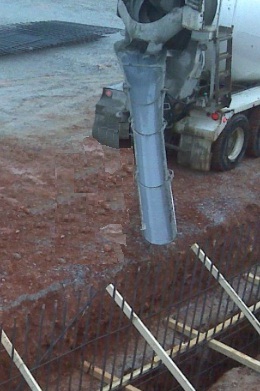 Normally it transports concrete to lower level like foundation from ground where mixer machine is installed. Not necessarily to deliver from mixer machine, sometimes they become a part transporting process like discharging plant mixed or truck mixed concrete from truck and then either by pump or any other lifting method is used to transport concrete to greater height. Normally chute is made of metal or lined with metal and provided with uniform slope. Generally a 1V:2.5H slope is adopted. The slope of the chute must not be flatter than it. The aim is to have a concrete of not segregated or separated while sliding on chute. The chute slope should be adjusted from workability of concrete mix. In case of chute having fixed slope, in some special cases, the mix design should be adjusted to produce a unsegregated concrete without hampering strength properties of concrete. -when a congested but undisturbed reinforcement arrangement is required to be concreted. -Where movement of workers to transport concrete is not possible due to lack of space. -where electrical conduits and plumbing pipes are crisscrossed above or in the reinforcement arrangement, having a fear to be disturbed by movement of labor. How long do I have to unload a 10 c.y. load of concrete from the time it gets loaded. What specification do you have to back this statement up ? ?